These egg hunt ideas are fun ways to add learning to your class egg hunts! You can choose your favorite of these egg hunts, or try them all during the Spring time. Plastic eggs are inexpensive, but of course, the best time to grab some is during the after Easter sales (and they usually have plenty of eggs). You can also ask parents to donate. If you like these activities, be sure to also check out the Easter activities category for more ideas! Use a jigsaw puzzle that is on your students’ level. In my Pre-K class, we usually do 12-piece and 24-piece jigsaw puzzles and we often work up to 48-piece puzzles with partners. For this activity, choose a puzzle that has approximately the same number of pieces as the number of students. If needed, you can break the class up into 2 or more groups. Place one puzzle piece in each egg, one egg per student. If you have extra puzzle pieces, go ahead and put those together on a table to get the puzzle started. Hide the eggs around your classroom. Have the children hunt for the eggs, asking each child to only get one egg. Once they have found an egg, they should bring it to the Large Group (or Circle Time) area. Call children up one at a time to place their puzzle piece in the puzzle. To make this easier, I recommend numbering the eggs and place the puzzle pieces in an order of pieces that go side by side so that this activity will flow more smoothly. For this egg hunt, place one Lego brick in each plastic egg. Hide the eggs around the classroom. Call children up to the table and have them add their Lego brick to the class Lego structure, building it as they go. If available, place a Lego baseplate on the table so the children’s building won’t fall over. In each egg, place a different colored linking cube. You might want to use about 3 colors of cubes for this activity. For example, you might have 10 eggs with red cubes, 7 eggs with blue cubes, 5 eggs with yellow cubes. When the children find their egg and come back to the Large Group area, have each child come up and stack their linking cube in either the red stack, blue stack, or yellow stack to make a hands-on object graph. When the graph is done, count to see how many has the most and least. You can do this same graph activity with many different types of manipulatives. You could use stickers, foamie shapes, counting bears, mini erasers. In each egg, place a different letter. You will need to half the number of eggs you are using and place uppercase letters in half of the eggs and lowercase letters in the other half. When children come back to the group, they will match up their letters with another child who has the same one. The letters tiles on the Alphabet Printables page could be used for this activity, or use Scrabble tiles, magnetic letters, or foamie letters. Here’s another way to do this activity: place 26 letters in 26 eggs and hide them around the room. Children will open their egg and match the letter to the letter sound on a letter chart. The letter sound chart is also available on the Alphabet Printables page. This game is played the same way as the Letter Egg Hunt above, but with numbers. You can have children match like numerals by copying Number Tiles onto one color paper and a matching set on another color paper. Or, have children match numerals to dice dots. This is played the same way as Letter Egg Hunt above, but with shapes. You could place foamie shapes in the eggs for children to match. Place small pieces of paper in each egg with the next step in a scavenger hunt. Make sure the eggs are numbered so the scavenger hunt goes in order! In Pre-K, read the sentences to the children and have the whole class work together. Fill each plastic egg with something that makes a sound. You will need pairs of eggs with the same item inside for children to match the sounds. For example, place rice in two eggs, place jingle bells in two eggs, and so on. Other ideas include rocks, cotton, broken toothpicks, coins, sand. Be sure to tape the eggs shut! If available, you might want to use white plastic eggs for this activity so that children aren’t trying to match the egg colors. Place pictures representing rhyming words in the plastic eggs. Make sure you have pairs of rhyming eggs that match. When the group comes together, ask children to open their egg and look at the picture. 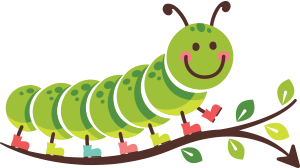 Start with one child, and have them tell their picture, then have the children decide which picture rhymes with it. Continue until all children have matched their rhyming words. Get a set of small Rhyming Pictures here! Place pictures inside the plastic eggs. When the group comes together, have children open their egg one by one, and tell the group what picture is on their paper. Have the group clap, stomp, jump the syllables in the word. 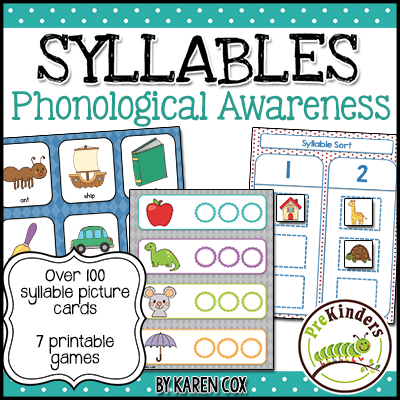 Get a set of Syllable Pictures here – since these are a little larger, you can either fold them, or print them smaller by following these directions.